Located in the Mediterranean and steeped in history, Corsica offers camping holidays that never fail to impress. With top quality campsites boasting superb accommodations, LUX-camp has some fantastic deals to take advantage of. For more information on the campsites available in Corsica, check out LUX-camp today. Corsica is the most mountainous island in the Mediterranean, with over 20% of its area covered in thick pine forest. Although officially a region of France, the island has had a history of invasions by Greeks, Romans and Lombards and was under Italian rule for over 500 years. With glacial lakes, deep gorges, stunning waterfalls and plenty of sightseeing opportunities, Corsica is a camper’s paradise. Close to Ghisonaccia, the Marina d’Erba Rossa campsite has luxurious accommodations and fantastic facilities. Stay in a fully-equipped mobile home and surround yourself with nature. Featuring a lagoon pool and a restaurant that overlooks the sea, this campsite comes highly recommended. Situated near Bonifacio and very close to the glorious Scafa Rossa Beach, Sole di Sari is a luxury camping site that provides ultimate relaxation. The lagoon-style pool and whirlpools are the focal point of this luxury camping resort and there are acres of stunning landscapes to explore. Located in southern Corsica, Acqua e Sole is an exciting family-friendly campsite that features a large pool, a poolside bar and restaurant and a professional animation team that will keep everyone busy throughout the day and entertained during the evening. There are more than 200 beaches in Corsica. The clear azure waters are perfect for snorkelling and scuba diving and the white sandy shores are ideal for a spot of sunbathing. 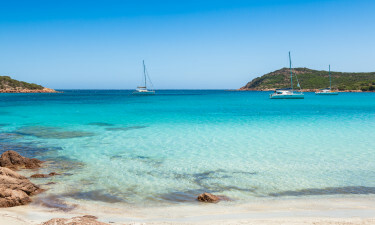 Among the best are Rondinara Beach, which is located near the town of Porto Vecchio and Saleccia, which is situated on the northwest coast. For nature-lovers, the Parc Naturel Régional de Corse is spectacular. Covering more than a third of the island, this nature reserve has stunning scenic landscapes to explore and is home to hundreds of species of plants and animals. Hike the ancient footpaths across rugged mountainous terrain, past pristine lakes and over green hillsides for a thrilling family adventure. For the more daring individuals, try the famous GR20 Trail which takes you on a 220km hike. 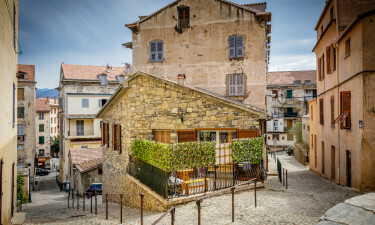 A visit to the 9th Century town of Bonifacio is a great choice for a fun day out as there are many historic buildings to see and a fabulous marina teeming with luxurious yachts. 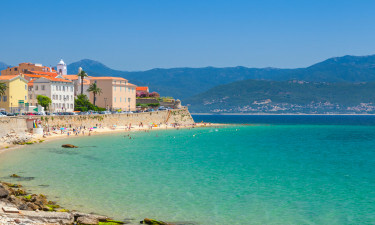 The capital city of Ajaccio is home to a fabulous array of designer shops and restaurants. 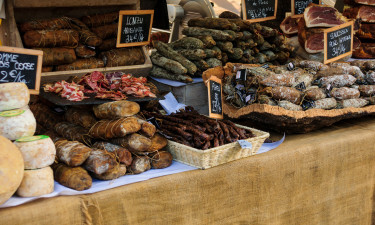 Corsica has a rich culture and has many local delicacies that are truly delicious, not to mention the wonderful wines that are available. Salamis and cheese are very popular and a great selection can be found in many markets and shopping centres. Traditional dishes such as prisuttu, which is a cured ham dish made from pigs that are fed on chestnuts, tianu, which is a rich game stew and agnellu, which is a tasty barbequed lamb dish.